An important math skill that all kids need to learn is how to count. In order to help your kids learn this, you can use fun count to 100 ideas that will get them excited about learning! Not only will your kids soon be able to count to 100 all by themselves, they’ll also have fun doing it. When it comes to teaching your kids how to count to one hundred, there are so many resources available. From printable games to hundreds charts, the fun possibilities are endless! Hands-on activities are great for teaching kids important skills. When you use hands-on activities, you’re giving your kids a tactile way to learn. This makes it more memorable and fun, helping to foster a love of learning. These hands-on count to 100 are perfect to start with. Free Number Trains Count to 100 – Students will use these number trains to practice counting to 100, as well as skip counting by 2s, 5s, and 10s! Around the World Count to 100 Puzzles – Here are some puzzles that help students count to 100. Learn to Count to 100: Place the Ones – This counting activity helps teach students how to count to 100, as well as place value! Sticky Hundreds Chart Math Activity – Check out this fun count to 100 idea! Math Activity: Counting to 100 – You can use popcorn kernels to teach counting to 100. Count to 100 Printable Snail Activity – Check out this adorable snail printable that helps kids count to 100. Kindergarten Crafts: Counting to 100 – This counting to 100 activity is fun and easy to learn. Count to 100 with a Paper Clip 100 Train Activity – Kids will love creating a paperclip train as they learn how to count to 100! If it’s time for your kids to practice counting to 100, then it’s time for you to break out the dice! These roll and count to 100 ideas are perfect for having fun while learning an important math skill. Kids will love playing these dice games. 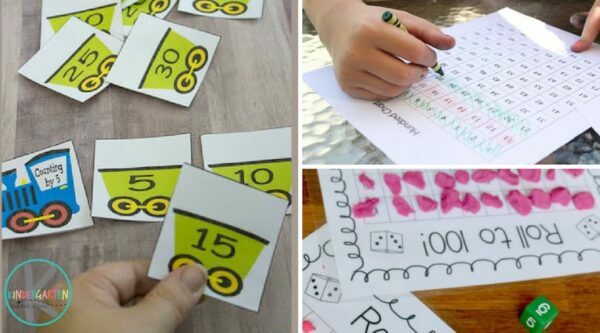 Roll to 100 Game – This fun game makes it easy for kids to practice counting to 100. Keeping Score with Skittles: Counting to 100 Basketball Game – This basketball printable uses Skittles to teach your students how to count to 100. Roll, Count, Color to 100 – This is a fun and easy activity that will help your kids learn how to count to 100. Roll & Count to 100 Play Dough Squish Math Game – Here’s a tactile learning activity that kids love! Use play dough to teach kids how to count to 100. Counting to 100 with a Forest Hundreds Chart – Use this themed hundreds chart to teach your students to count to 100. Race to 100: Get Moving – Here’s an interactive and hands-on count to 100 activity your kids will love. Don’t forget to have some holiday fun during the school year! These holiday-themed count to 100 ideas get your kids in the festive spirit while helping them to learn. It’s a win-win! Hundreds Chart Winter Coloring – These adorable winter-themed coloring charts are perfect for counting to 100! 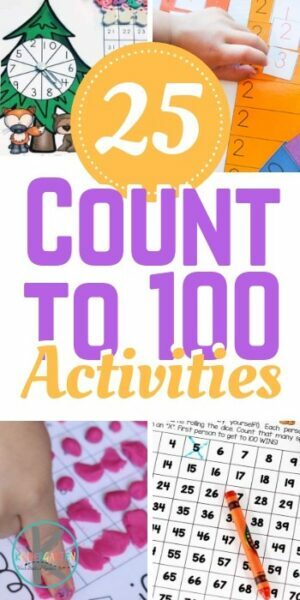 Groundhog Day Count to 100 – This upcoming Groundhog Day, practice counting to 100 with this themed game! Hundreds Chart Valentine’s Day Coloring – Use these hundreds charts to practice counting while having fun coloring! St. Patrick’s Day Hundreds Chart – Have some St. Patrick’s Day fun with this count to 100 activity! Hundreds Chart Easter Coloring – Here are some hundreds charts that celebrate Easter while letting your students practice counting to 100. 100 Chickens Preschool Counting Activity – This count to 100 activity is perfect for springtime! One of the most fun things to do during the school/homeschool year has to do with keeping attendance! No, I’m not kidding: Kids love keeping track of how many days you’ve been in school, so use that to your advantage. Try some of these 100th Day ideas. Tally Mark t-shirt – try creating a t-shirt that has 100 tally marks! A cake with 100 candles – It’s not that hard to do – put 100 candles on a cake (and it doesn’t even have to be a real cake)! 100 Cup Structure – give children some solo cups – 100 to be exact – and see them have fun while trying to build a structure with them. Dress like you’re 100! – it’s always fun to dress up! Why not celebrate in “old person” style? Learning to count to 100 can be so much fun! 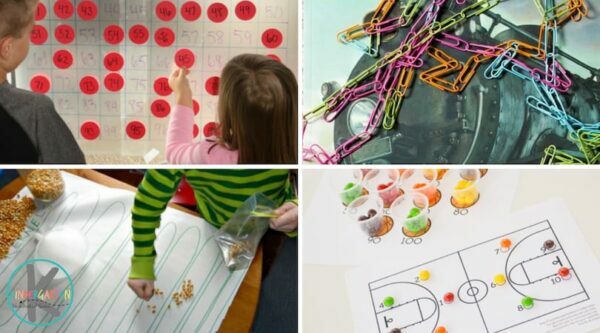 These count to 100 ideas are perfect for starting the learning fun. Which of these ideas are you excited to try?